This new box set is classy. 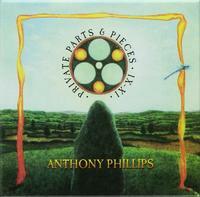 You get three previously released Anthony Phillips albums, Private Parts & Pieces IX-XI. While you might think that makes this a three CD set, you'd be wrong. There are actually four discs here because the final one is made up of previously unreleased music that didn't make those albums, but was recorded at the same time as them. If you've followed Phillips' career at all, you'll know that he's hard to pin down in terms of musical genre. While he got his start with Genesis, that hasn't been the defining point of his sound. Indeed, the three main albums here range from acoustic guitar based sounds to classical piano and electronic. Each of those sounds dominates one of the albums. Other than one song here, this is an instrumental. It should be noted that I've reviewed the three main albums individually, too, and those reviews are included here for the track by track sections as it's the same music. Each CD here gets an overall review after the title, followed by the track reviews. I've heard and reviewed a large cross-section of Anthony Phillips' music. One thing you can count on with him is quality. What you can never be certain about is the type of music you'll get. Here we have an album of mostly instrumental music. It has a bit of a New Age vibe to a lot of it. While probably the majority of it is acoustic guitar based, there is also some keyboard music here. All in all, this is quite a pretty and entertaining set. Delicate and quite intricate acoustic guitar work serves as the "opener" referenced by the title. Here we have another gentle acoustic number, but it's perhaps more "song" like than the opener. Even further into the "song" like direction, this has a bit of travelling folk music vibe. Beyond that, though, the overall concept isn't changed dramatically. The gentler, mellower section later in the piece is particularly pretty. There is a definite jazz guitar vibe to this piece of music. At less than a minute in length, it's a short one. Feeling a bit like Synergy or Tangerine Dream, this is a big change with more of an electronic arrangement. The keyboards on this are quite atmospheric, but still manage to convey melody at the same time. This lands in the neighborhood of New Age music. Feeling almost like an extension of the previous piece, this atmospheric number seems both bleak and beautiful. This does feel like a slow moving, barren vista found under the ice. This builds out into more of a rocking zone. It definitely has elements of old Genesis sound. It's still intricate. It's just more powered and vibrant. It's short at less than a minute and a half long. The only song on the disc with actual vocals, this is a pretty cut. It's part progressive rock and part folk rock. A short guitar based piece, this is another intricate number. Gentle acoustic guitar leads this piece out, as well. There is a lot of energy in the number. Coming in with much more of a rocking (but still acoustically driven) sound, this has a definite folk rock kind of vibe to it. Atmospheric textures bring this piece into being. The title really fits this track. This is intricate and pretty, like a flower, but there is a melancholy texture to it. It's a slow moving piece. There are some operatic female vocals here, but they are more like instrumentation than actual vocals. This is another pretty and slow moving piece, but it's more electronic than the last one. It is quite atmospheric. This is the epic of the disc, weighing in at 17 and a half minutes. It starts with the acoustic elements in slow moving, intricate textures. It gradually grows outward from there. While the volume level doesn't really change, the cut makes its way through a number of movements and themes, and it does intensify at times. It's hard to believe this piece is as long as it is because, despite the fact that it's strictly acoustic guitar, it never feels tired or redundant, and the time just seems to fly by. Atmospheric keyboard textures hold it together as the acoustic guitar weaves pretty patterns and melodies. This rises up delicate and very beautiful. I'm reminded of Phillips' work in Genesis to a large degree. More electronic, this number is bouncy and rather fun. Anthony Phillips first came to prominence as the original guitarist for Genesis. Since leaving that group he has released a very extensive catalog. All of his albums are of high quality, but there is a wide range of sound changes from set to set. This one is all instrumental and mostly classical piano based. It's quite a strong album, really. A song that seems to have the perfect title, this is a piano solo that seems to depict that particular ballerina. Another piano solo, this one seems to be more upbeat in terms of mood. It's very much a pretty classical number. This has a bit more of a tentative vibe to it. It grows gradually, but is another very classical music oriented piece. I love the delicate little fills on this classically oriented piano piece. It has a great energy and moving arrangement. While this isn't a huge change in terms of the type of music, this is quite powerful and dynamic. It has gentle sections and more bombastic ones. Another potent piano solo, while this isn't a huge change in terms of style, it is different thematically. I love the tone and rather melancholy mood of this piece. Moving both in terms of emotion and the energy level of the track, this is a very powerful number. Yet it also has some forays into pretty oddities as it works its way forward. It is quite a dynamic number. Pretty and at times gentle, this is also especially evocative. There is somehow an olde world vibe to this in a rather ethnic way at times. Fast paced and dramatic classical piano work drives this number forward in style. Another pretty piano solo, this not greatly changed from the other material around it, but is a strong entry with its own identity. Gentle and a bit dreamlike, this is quite satisfying. There is a great contrast on this composition. Part of it is forceful and bombastic. Other parts are sedate and delicate. They work together nicely. Somehow this reminds me of the type of music you might hear at the start of a soap opera. It is gentle and a bit sad. I suppose given the dedication and title that makes sense. Another pretty piece of music, this has some powerfully emotional sections. This is a poignant and soaring kind of number. It has a lot of bombast and drama in the mix. It also has gentle respites built in as a sort of resolution. Trippy atmospheric electronic sounds are the basis of this number, making it a big contrast to the rest of the album. Yet it really fits well within the sound of the set. This is so powerful and dynamic. It's also rather extensive at six minutes of piano music. It starts with a fast moving section that plays through. Then around the half way mark it drops way down and starts to build back up from there. This next section gets particularly powerful. Presenting a contrast to the louder and energized movement that closed the last piece, this is slow moving and delicate. It's sad and also pretty. This isn't a big change, but it's another pretty classically based piece of music. Each album Anthony Phillips releases is quite different from the ones around it. This particular set is made up of atmospheric electronic music that calls to mind things like Tangerine Dream and Synergy. It's a mostly restful collection of fairly short pieces. It's also a fine entry in the Anthony Phillips catalog. Rather mellow and atmospheric, this is also quite lush and electronic in some ways. It's a short piece at just over a minute long. As you might expect from a piece called "Piledriver," this comes in more rocking, but also quite synthesized. It's a powerful bit of electronic music. Lush and very pretty, this has definite classical music elements. Yet it's also atmospheric, at least in terms of the opening section. Some electric guitar rises up after a time, weaving some great lines of distorted melody. This makes me think of both Tangerine Dream and Pink Floyd quite a bit. Gentle electronic elements create a pretty sonic tapestry on this piece. More energetic keyboard sections bring this into being. Again, I can hear comparisons to Tangerine Dream, but also to Synergy. It shifts toward the more textural as it continues. A dream-like quality is built over the top of this piece. It grows upward within that same concept. Delicate and quite pretty, piano drives a lot of this number. Textural and pretty, this is a tasty number. I love the building modes on this piece. It's a intricate piece of electronic music that works quite well. More textural sounds are in place on this slow moving number. Somehow this atmospheric number really does feel like an underwater excursion to me. Another slow and textural piece, this is gentle and pretty. This is just around a minute long and quite sedate and textural. Again, there is a vibe like that of the ocean here. It really does feel like drifting deep underwater. Not a big change, this is more atmospheric electronic music. It's less than a minute long. There are some parts of this that make me think of Mike Oldfield a bit. This is a bit more intricate and melodic. This is another short textural piece. It has a bit of a dreamlike quality to it. Atmospheric elements bring this into being, and it rises upward gradually. This number has a good amount of energy. There is a percussive kind of element that almost feels like the "click clack" of a train on the tracks. Gentle and quite pretty, there is almost an Asian element to this. Pretty melodies move this piece in electronic ways. This is a short piece that has a definite symphonic element to it despite it's sedate texture. Still quite textural and pretty, there is an almost otherworldly element here. There are some chorale voices later in the piece, but they seem to be synthesized rather than real. Rising upward via intricate sounds, this has a dense arrangement despite its sedate nature. Guitar textures bring this into being and move it forward while still keeping much of the sound of the rest of the disc. There is actually a feeling of clouds floating above the Earth on this number. There is some particularly pretty piano at the heart of this cut. In fact, it's essentially a piano solo. More textural modes are the basis of this sedate number. This short piece is another that makes me think of Mike Oldfield. There are synthesized chorale vocals here. This does have a melancholy vibe to it and is pretty. A piano based part takes over later with atmospheric electronic elements replacing it later in the track. Bell chiming sounds and other atmospherics are on display on this number. It turns more classical near the end. There is a false ending and then some dramatic (but still sedate) elements rise up to actually serve as the closing section. The final disc of this set is made up of previously unreleased material. This music is other recordings and alternate versions of pieces that made it onto the three main discs here. Honestly, perhaps this set is more balanced than the others because it has a smattering from the three other discs. This doesn't feel like leftovers because it has some solid stuff on display. An acoustic guitar number, this is a full on rocker. It definitely lands in the folk prog vein, but is seriously rocking. It also has plenty of intricate elements. While this is rather classical in nature, it really has a lot of energy and drive built into. There are some sections of particularly intricate piano work, too. At almost six and a half minutes, this is an extensive piece. Almost a blues rocker, this still has a prog edge to it. I love the melodic electric guitar soloing over the top. I dig the electronic ambient textures on this. It calls to mind Mike Oldfield a bit. Intricate acoustic guitar is on the menu here. This gets quite effective and feels a bit like early Genesis. Electronic and almost rhythmic, there is a cool groove to this piece. Piano creates the textures and melodies of this cut in a somewhat classical way. There are several movements and moods built into this piece. At about five and a half minutes of music, this has plenty of space for Phillips to explore. He makes good use of that space. I love this intricate guitar based piece of music. There are some intriguing melodies at play here. Again this isn't that far removed from the kind of thing you'd expect from early Genesis. A mellower kind of textural sound is at the heart of this intriguing number. The melodic elements move slowly along. I love the picked guitar work on this number. It's very much in line with a cross between classical guitar and folk music. Keyboard textures create a pretty and rather poignant piece of music here. Piano brings this in with style. The cut is just under a minute long and purely a piano solo. This piece doesn't have the voices that are heard on the other version. I think I like it better in this form. It seems very sad. There is a bit of a droning guitar element with other sounds creating intricate melodies over the top of it. Spanish guitar and electronic textures make up the musical concepts. A fast paced and dramatic piano solo is the concept here. This is a real powerhouse of a piece with plenty of classical music in the mix. There is a gentle segment later that eventually takes this to its closing. More textural electronic music, this is a pretty cut that works quite well. It starts powerful and lush and seems to wash out like the tide, gradually fading downward in intensity. There is a bouncy sort of electronic prog motif at the heart of this version of the earlier piece. This isn't a big change from the other rendition.